A'GACI is a contemporary retailer who touts themselves as a "one stop shop" for the modern, trendy and glamorous. With offerings of mini skirts and body conscious dresses it's evident that they have a centralized focus on attracting juniors, but with their wallet friendly prices I'm sure many of you ladies can still find items to incorporate into your wardrobe. A'GACI has 40 stores nationwide and has had their fashions featured in Lucky and People Style Watch. Though this retailer is new to me, after perusing their site I find that some of their pieces are eclectic and offer an almost unique appeal. 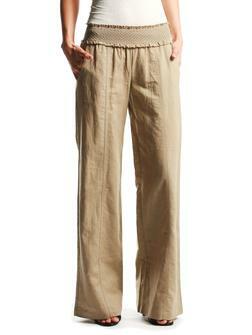 You can even find classic pieces like wide leg linen pants, which are always a wardrobe essential. And though the quality would likely not be on the level as a pair purchased from Macy's, they can certainly be casual foundation pieces that you rely on for brunch, shopping and family outings. A few of their items caught my eye, so I am curious... How about you? With the likes of H&M and Forever 21, would you be interested in shopping another juniors retailer? You can check them out here. Have you shopped A'GACI before? If so, please post a comment I'd love to hear your thoughts on clothing quality and sizing.